Oisin Biotechnologies Produces Impressive Mouse Life Span Data from an Ongoing Study of Senescent Cell Clearance – Fight Aging! The image presented here is taken from the Oisin Biotechnologies PDF that accompanies a presentation given at the recent ICSA meeting in Montreal. We should certainly hope to see more of this sort of thing in the years ahead as senolytic technologies improve. Am I reading this right? That this study is still ongoing? That 90% of the p53 and p16 mice are still alive at 130+ weeks? This is the kind of data that Aubrey is talking about when he says that 'Soon everyone will know that this is possible'. Raise a glass my friends, we have made a LOT of progress this year. Data is starting to speak and it's telling Aubrey he was right on the money ! Kudos to the excellent team at Oisin and everyone who supported them, including you Reason and the Methuselah Foundation. Hello everyone. Does anybody knows what PBS on the graph stands for? Does it for placebo? Are these mice genetically engineered to secrete something from p53/16 cells that therapy targets, or are they wild type? What shall be really telling when the study is complete, is the effect on maximum lifespan. @Mark: Standard issue C57BL/6 wild type lab mice. The Methuselah Mouse record for now is about 260 weeks. By definition, we will need two and a half more years beat it using p53+p16. What is remarkable that the control group (PBS) has flat mortality after week 122. In fact , no mortality at all. I guess the ones surviving 122 have the longevity genes. If we compare weeks 112 to 118 we have a precipitous drop in the survivability , about of 50% of all the living individuals at week 118!!! Another interesting observation is that the drop of p53+p16 on week 127 is almost the same as the first drop of p16 on week 114. It is like p53 postponed something that p16 could not handle but it has came back 13 weeks after. One point to keep in mind - these are preliminary data. When the study ends my personal prediction is we may not see much max LS extension, but rather a fairly significant median LS improvement. That's intuition, not analysis. Subsequent to this presentation, we have seen additional mortality (one p53-treated and one additional control mouse dead) but no further change in the p16 or combo cohorts. We are currently at 6 treatments and just over 135 weeks. Can you guess the shape of the mortality curve for the controls from other studies? So would you expect a sharp decline at the end, which would lead to almost square shape of the chart ? will you not expect at least the same maxLS extension as from calorie restriction ? @cuberat: I'm assuming "squaring of the curve" similar to what the Mayo team saw in the 2016 Nature paper. I don't want to speculate on max LS for at least another 6-8 months. how soon do you think human trials could start, assuming all goes well with the mice and other animal models? From the report I read that "Forty aged mice were randomly put into these groups ". It would be interesting to know how many mouse originally were in each group? Did each group have the equal number of mouse, 10 mouse in each group or not? cuberat: flat regions of mortality are not surprising. This is a survival graph, which means that each time a mouse dies, a line drops; if you count the number of drops in the control line, there's apparently ~5 mice left in that flat part. With n=10 in each arm, that's just not a lot of mice which *could* die and make it wiggly. Flatness is inherent to the sample size & method of visualization. The experimental designs are similar. The question is how far right does the treated group move on the time axis before it starts the decline, which I'd expect to reflect the quality of the senolytic, given enough mice to dampen down the law of small numbers. I wish they would have double blinded the study. Is it common to not double blind these kinds of studies? It wouldn't raise the cost of the study by much. It would also depend on how genetic or specific the exact senolitics are. Also there might be more pathways that prevent apoptosis. In this case the senolitics will remove point a fraction of the senecent cells. It wood be too simple and too easy if there were only p16 and p53. Wouldn't initiating cell apoptosis based on an activated p53 pathway also reduce incidence of death from straight cancer in the mice, not just from senescence (yes, which does cause cancer along with a whole lot of other ailments of aging)? YES!! Congratulations to Oisin's staff and all its supporters! For Gwern, "This is a survival graph, which means that each time a mouse dies, a line drops; if you count the number of drops in the control line, there's apparently ~5 mice left in that flat part." But the red line drop at week 113 is huge, I suggest this line drop represents 2 mouse deaths. So in my opinion, after 123 the red line points at 40 % in survival axis, which means 6 mouse died and only 4 left. (Each mice death is represented by 10% line drop). Alternatively I would suggest that the graph is very schematic and was drown not in scale. Gary said he expects a squaring the curve effect, with little effect on mouse max lifespan. I agree this is likely as nothing is being done to replace those ablated cells using a telomerase/stem cell treatment. It would be nice to be surprised however. I'm wondering if Oisin have in fact solved the long standing safe, efficient, and repeatable delivery problems of gene therapy? A quick google search reveals Entos Pharma who seem to be licencing the technology for use in regular gene therapy. From what I understand the fusogenix protein causes the lipposomes to fuse with all cells, is there a way to target specific cells types selectively? I would expect it to have similar effects as calorie restriction. Move have high Max LS plasticity. Humans, on the other hand don't. However, the mediant health span gain might be quite huge. I don't agree Cuberat. Calorie Restriction and Senescent cell removal are quite different beasts. The former will slow cellular senescence, the latter just removes them, without impacting their rate of accumulation (note - SASP induced senescence will be reduced, but more cells will need to divide to replace those ablated; it is an open question whether this will slow down or accelerate senescent cell creation). @Jim: On cancer, yes, you'd expect the p53 targeting to reduce cancer rate significantly. That's a big deal in mouse life span studies because their cancer rate is high. You might recall the debate over whether rapamycin actually slows aging across the board versus only reducing cancer incidence. Determining the difference between those two things in mouse studies isn't straightforward. I'm wondering if CD38 protein levels could be used as a valuable biomarker of senescence in these mice studies, as it is known to increase in mammals during aging, representing a decline in NAD+ metabolic levels with increasing age. If Gary is still around, can he comment on the health of the treated mice? Are they robust and vigorous? Are they doing better than the untreated ones? I don't have quantification of robustness, but they seem healthy. By the way, in response to the question about cancer rate - the Nature 2016 paper reported a 50% reduction in cancer incidence in treated animals (p16, they didn't target p53). So far we have not seen cancer deaths in our treated animals, to my knowledge. Someone also asked about group size - 12 animals in PBS, 10 each in p16 and p53 and 9 in combo. Just the way the randomization came out. I'll caution patience once again. The study will run until all animals die, and then we have to publish, so we still a long way from a peer-reviewed paper. Meanwhile, we'll be seeking collaborations for replications, moving into other mammalian model organisms, and refining the platform as we move to Phase 1 clinical trials for solid tumors in 2019. For Gary and everybody please. How many mouse from the control PBS group is left in week 130? According the graph the red line points at 40 % on axis of survival by week 130. Every 10 % drop represents death of 1 mice. We can clearly see 5 red line drops by week 130. Originally the BPS group (the red line) has 10 mouse. Is this correct? Many thanks for clarification. @Aleks: see my post above. We had 12 animals in PBS group; as of today (~136 weeks) 4 are surviving. The graph above reflects survival of 5 animals. Each death in PBS is a drop of 8.3% in PBS only, 10% in p16 or p53 and 11% in combo. This approach seems to work quite well alone, and since it uses a different target might have nice synergistic effect with some other approaches. @ Gary. Many thanks for your explanation. Now the data on the graph makes to me a sense. I'll importunately wait the final result of the experiment. Please keep us update. 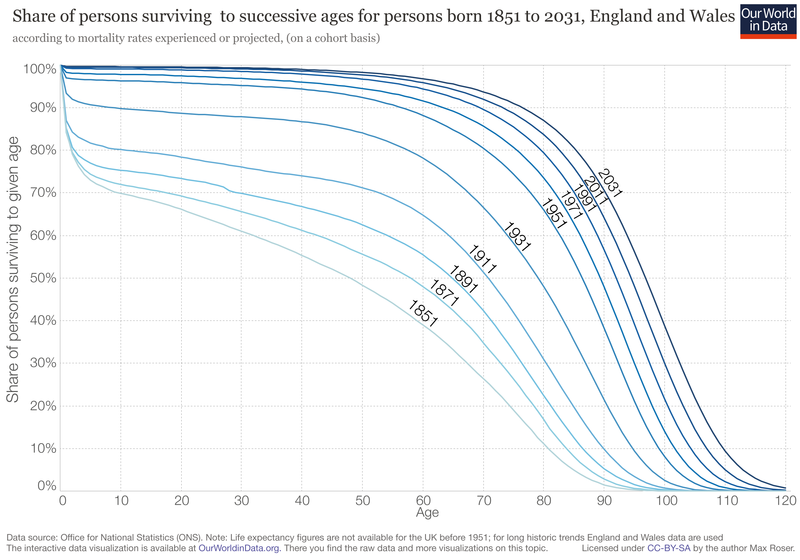 The squaring of the curves means that maximum lifespan status is almost the same while the average and median can grow significantly. That's what we witness with people. The life expectancy grows yet the max LS stays more or less the same. However, mice have more elastic Max lifespan. So in theory of there is a treatment that can increase the survival across all ages and shift the whole survivability curve right we can speak of de-facto statistical rejuvenation or delay /slowdown of aging. But all this fancy curves aside , even if you increase only the health span , it is already huge. @Cyberat I know the broad stokes as to what squaring the curve means. No doubt there are details such as extrapolating data from small sample sizes I don't know, or really need to know if the data is robust enough. My point was, given the current mortality rate of the controls, all the controls will likely be dead by week 155 or 160. 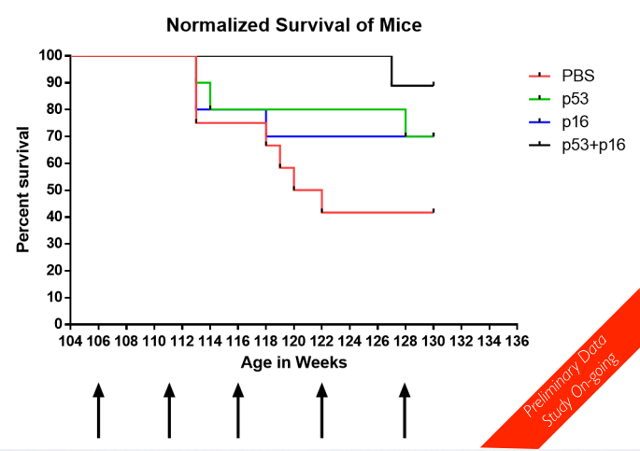 And if there are still 5+ mice from the combo treatment group alive by say week 165, I think one will be able to say with a high degree of confidence the combo treatment extended maximum lifespan (for mice). Without having to wait an unknown number of weeks for all the mice to die and all the numbers to be crunched. We always say that human maximum lifespan is not elastic, unlike mice, but I wonder if this is really true. As Cuberat points out, medical technology has already 'squared the curve' for humans - so this, I think, is probably why calorie restriction and other metabolic interventions seem to only improve healthspan and not lifespan: we already have banked those years (in various states of ill health) due to healthcare, which mice do not have access to. At Zoo near where I live they have a penguin that's 40 years old and still fertile. She has Vets on call and is given anti inflammatories daily. Bet she wouldn't live much longer with CR either. I have found a survival curve from a calorie restriction study. There the time is given in months, though. How do you think all these treatments will be commercialized? For example by selling patents? Opening clinics all over the world? By franchises? Another? I mean, if we want to get involved as a seller, how do you think it will be possible? What Reason and others say is not that human lifespan is not so elastic as mice lifespan, but that it's not so elastic as mice lifespan for the treatments usually used to extend lifespan in mice, that is, calorie restriction, exercise mimetics, rapamycin and the other "messing with metabolism" approaches. Those approaches work worse for long lifespan species because all of them are more or less evolved adaptations to survive famines, and thus provide at most a couple of years of life extension, independently of the species, because longer famines are just to rare to develop adaptations to them. OTOH, damage repair approaches don't rely on evolved, natural life extension mechanisms that the subjects are born with. Thus, the amount of the extension is not restricted by that couple of years. @Josep: The usual path of selling the developing company to Big Pharma, that then finalizes the clinical trials and markets the therapy to physicians for specific diseases of aging. The question is the degree to which that usual path will be augmented, as happened for stem cells, by clinics outside the primary regulatory environments. I think it will be much more prevalent for senolytics, given how cheap the initial candidate drugs happen to be. Gary, can you update us on the surviving population? I think you were at 4/6/7/8 for PBS/p53/p16/combo in mid-July? Thanks! Wow, what's the problem with p53? Alas the sample size is too small to make any definite conclusions. If the p53 drop turns out to be real, the explanations cold be numerous... Like being to toxic late at life and need trying the protocol. But yeah. P53 target alone send to square the life expectancy curve. And the combination finally postponed the mortality by at least 30 weeks. So this detoxification protocol while impressive is not our miracle. But if it translates well in people, can buy you 10-30 more years of healthpsan. ... Count me in ! Hello, using about 10 mice per group is VERY LITTLE. Mouse lifespan tests typically use n=25 per group at least to statistically demonstrate good-but-non-giant-effects (http://agevivo.com/stats/LOLES.html). At this stage (I checked and you can reproduce it just here below), there is NO statistical significance it could quite be random luck for now. Unless the treated mice show a nice maximum life extension, the results may barely be of statistical significance ==> @Oisin team, suggestion that you start at least another round of mice in parallel, without waiting more!!! - looking at the curve there are 12 control mice, 10 p53 and 10 p16 mice and a priori 9 p53+p16 mice. Comparing just PBS and the combination leads to p=6%. Doing many comparisons like this would require a low p (5%/n tests) to be convincing. All the best for so interesting experiments. Regarding that human lifespan is not so elastic as mice lifespan... perhaps, perhaps not. -- a 2018 paper about CR in Lemurs shows a 50% life extension (from 6 to 10 years) while reducing cancer rates by 5 fold: (Pifferi et al. 2018). It seems to me that this study is being ignored due to a lack of advertising compared to the US studies, but it deserves probably the same advertising. Regarding humans, some people argue that there is no superlongevity found in humans, perhaps this is true, but without looking far there is an interesting male-female difference, and -something I never disclosed but I do it here- there is a **strong neurodegenerative aging rate** in humans (that starts very low at young ages) so as soon as we have strong therapies against Alzheimer's and Parkinson's we can unleash other improvements on general aging. Are the mice still alive? But due to the small group size the results could be questioned if the effects is small..